Let me just say, I think I'm going to start taking all my outfit photos in the morning whenever possible. I'm absolutely smitten by how well these images turned out, and the shoot was actually a lot of early morning fun. It's so much more relaxing when you're not worrying about losing daylight. After the photos we had a doggy date with some friends and ate a nice lunch of french comfort food, which means we had yummy crème brûlée. Then later in the day we had some drinks and saw a very funny comedy show. By the way, I have no idea where I got this clutch from but isn't it awesome? Flowers and leopard print...wwhhaatt! | Red penguin print blouse c/o Chicnova | Target Mossimo blazer | Spike & chain collar pin c/o Chicnova | Target dot jeans (similar) | DSW Luxe810 Gucci nameplate pumps | NYC City Duet 2-in-1 Empire Lilacs lipcolor | Modcloth Through the Wire headband (similar) | Classic Winchester lady watch c/o Daniel Wellington | Kudos to the hubs for climbing in a tree to get that overhead shot. And don't you just love how easy it is to spice up an ordinary shirt with only some red penguins? That's what drew me to this collared blouse from Chicnova. This site is a great option for some fab fashion finds so check them out if you haven't already. 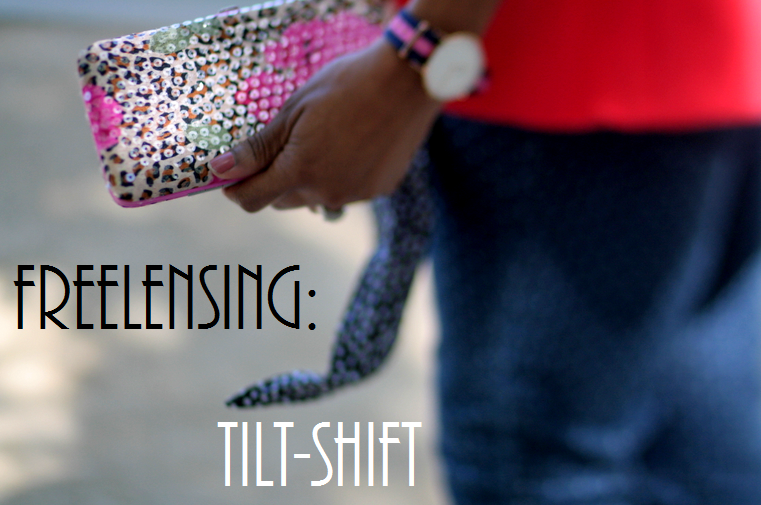 I got some blogger inspiration from Fashion Is Evolution when we were both featured in IFB's Links a la Mode last week. She did a great post on Freelensing (detaching the lens to change the focus) so we tried it out and were fairly successful. You look great Cheryl! I love your pants (super cute), top & blazer. Love the color of your heels. Your husband did a great job. Nothing beats good sunlight! You are shining! Glad you had a great weekend and wishing you a lovely week. Love your creative mix of prints, you pull it off with great flair, thats the cutest printed shirt I have seen, you look fantastic hun! The photos are gorgeous - the lighting is just perfect - and I'm crazy about those printed pants. That penguin printed blouse is so cute! It's nice to have more daylight I agree. I also love those dotted jeans! :-) Happy Monday! The cutest outfit! The sweetest Cheryl! Hope you had a lovely day! Your husband did a great job and I love the light in these shots! That is such a great overhead shot! I recently got into the printed pants thing, and I'm seriously hooked. Love the polka dots, and the picture with the matching headband. Nice skinny jeans!!!! I really like your print-mix!!! Love the look and your blog. following you via gfc now, follow back?? I love this look! The colors, the prints...they're all beautiful! Also, I love that headband on you! 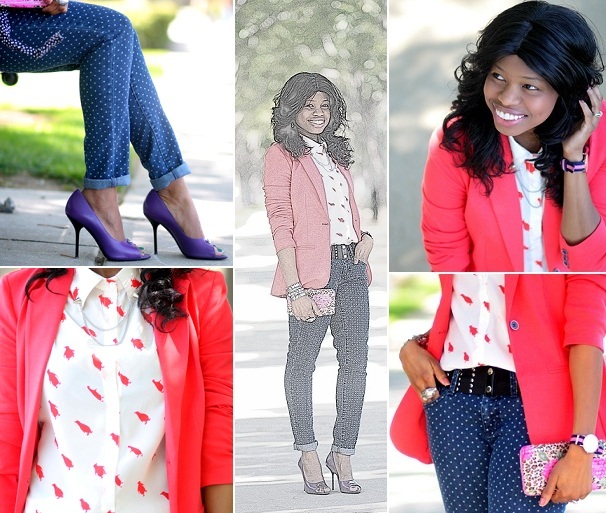 the light here is perfect and you look so gorgeous - your polka dots pair perfectly with the red/orange blazer! You look super cute! I love the polka dot pants and that last shot turned out perfect! Love the coral blazer! There's something so fresh about Coral for spring! Cheryl you look stunning I am loving the entire outfit from head to toe big ups to Ari for taking a brave chance!! Love the mix of prints. Polka dots are always so fun! Great casual look! Very polished look, you look amazing in that pink jacket. great combo. I loooooooove that penguin shirt! I love the mix of prints! Polka dots are so fun. The lighting is great in your photos. Dots and patterns are two of my favorites. I love this look! The only thing better than the jeans is that smile. Gorgeous! I can't help but love polka dots every time I see it. :D You wore the colours well and the prints go so beautifully together. That printed denim is ADORABLE! I also take my photos either at dawn or dusk. Best lighting means less fuss later. So glad to have found your blog! Loving it!